Dephormation - What is Privacy? Does it Have a Future? Privacy seems to be a frequently misunderstood characteristic of our lives. You don't own privacy. You can't touch it. You can't buy it. When you lose it, you can't get it back. So what exactly is it all about? It might come as a surprise to learn, your privacy is not in your hands. Your privacy is in the hands of the people you give information to. Hopefully people and businesses you can trust. In other words, your privacy is lost when someone you don't trust obtains access to information about you that you would prefer to be secret from them. Loss of personal privacy is usually associated with a betrayal of confidence, by someone you did trust with information. Rarely, but increasingly, a self betrayal may be to blame. For example posting personal information to a public web site is often cause for later regret. All of us have varying levels of confidence in the people around us, and communities in which we participate. I like to think of it as an onion ring. Me at the centre (the person I trust most with my personal information). My spouse is my most trusted confidante. My immediate family next, then my wider family, my closest friends, my wider circle of friends, my colleagues, my neighbours, my bank, and so on... with the global community of people I've never met on the outer ring. 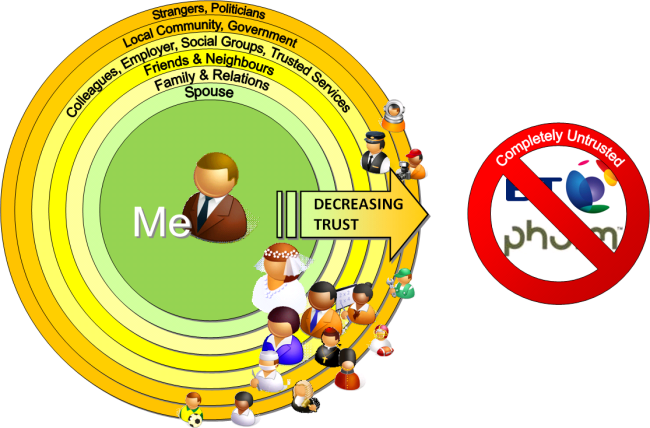 Within those circles of trusted people, they are groups with whom I choose to share personal information. Then there are the people and businesses I don't trust. Particularly those who betray my trust. Those businesses and people join a special group I will never trust and actively avoid. Preserving personal privacy is then a question of careful decision making on the basis of trust. Carefully selecting trustworthy people with whom you share information, minimizing the information you share with them, and otherwise obscuring your identity and information as much as possible so the two cannot be linked by people you don't trust. When you conduct business, privacy & confidentiality is an essential characteristic. Businesses generally need to protect information about clients, suppliers, transactions, products, services, research, and business plans. Competitive intelligence gathering attempts to obtain, lawfully, as much information about a company as possible from public sources allowing competitors to acquire knowledge of a target's commercial secrets. For that reason enterprises try to keep commercially sensitive information as confidential as possible. Industrial espionage is a term used to describe illegal methods of data gathering, such as communication surveillance, or interception of letters, or covert bugging to obtain information. Communications companies are in a privileged position. They are able to observe all of our unencrypted personal and commercial communication. If we cannot trust telecommunications companies, they can do untold harm to our personal privacy, and economic well being. For that reason, the telecommunications industry is governed by laws requiring respect for the confidentiality of communications. In the case of BT and Phorm, those laws were violated covertly on a national scale. Yet no one has been arrested, no one prosecuted, no one convicted, and no one jailed. So Does Communication Privacy Now have a Future? The good news is, yes! Without a doubt. Privacy remains essential, a personal and commercial necessity. If Government won't protect us from illegal surveillance, we have to protect ourselves. There are three effective responses to loss of communication privacy. The first is aggressively penalising the organisations that violate the privacy of telecommunications (by refusing to do any business with them). The second is generously rewarding those organisations that do respect the privacy of data entrusted to them (by transferring all our business to them). And finally, learning about and using encrypted methods of communication. If Governments won't protect us from illegal surveillance, encryption certainly will. If so, perhaps this is the future of UK communication privacy? Widespread use of encryption.